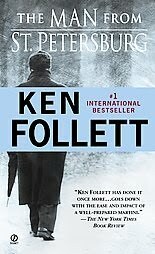 What makes Ken Follett so great, in my opinion, is his ability to take a really dull subject and create a book around it that is exciting, thrilling and suspenseful. Thinking back on all of the Ken Follett books I've read: The Pillars of the Earth was about building a cathedral, World Without End was about building a bridge, A Dangerous Fortune was about banking, and The Man From St. Petersberg was about foreign policy in 1914 England. All of those topics sound so boring when I read that list, but Follett makes them into a book that I can't stop reading! I was a little apprehensive that The Man From St. Petersberg wouldn't be as good as the previous Follett books I've read, but it was. It was a shorter book so I was able to speed through it and after the first 75 pages, I just couldn't stop! The Man From St. Petersberg is about two star-crossed lovers and the paths their lives take after their heartbreaking forced separation. The way Follett weaves his plots together, taking events that seem unrelated and then making them all tied together at the end, is so satisfying. I also really enjoy the way he writes relationships and feelings. His poetic justice is another selling point, as well as his pacing. Can you tell that I love Ken Follett? This one was a little harder to get into than his other books. The relationships and character development. I enjoyed your review. I'm going to start reading his books next. No one can beat Follet at the classic spy game story teller. Have you read Eye of the Needle? lest we forget his earlier works Key to Rebbecca and A Dangerous Fortune. Pillars of the Earth masterpiece! Still have to read the sequeul which is sitting on my shelf... arghhh too many books too little time.